This may well be the best granola you're ever going to eat, so get ready to establish that self control. It is tempting to gobble away the delightfully sweet and crunchy 'breakfast' food I am about to divulge, but when eaten in excess, it crosses over to junk food! So, enjoy a serving with some yogurt (coconut yogurt works well :) and fruit, or pack it in your bag with dried fruit and a bottle of water for a day outing. Top it with my Coconut Cashew Cream topping, at home. Whichever method you choose, you're sure to enjoy my modified version of Grandma's homemade granola. 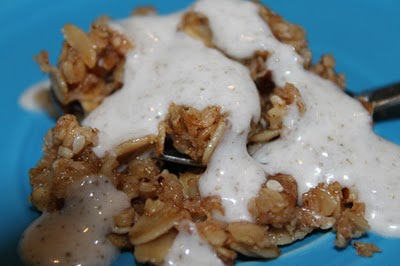 This is a very filling and versatile granola. The recipe is easy to adapt to suit your needs. Spread onto a large baking dish. Stir frequently to avoid burning around edges or on bottom! Let cool and enjoy! This is a fabulous breakfast when coupled with fresh fruit or a fruit/vegetable smoothie.